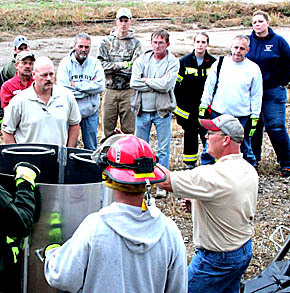 Albion Fire & Rescue took delivery of new grain bin rescue equipment last Thursday and received training in its use from Craig Boerg of Outstate Data. The equipment was donated by Farm Credit Services. It includes panels that can be driven in to wall off grain and allow rescue of victims trapped underneath.